Reese River Valley is more or less triangular, and I live right in the middle of it. When you take into account that trees taller than 30 ft are not really native to the high dessert, you don't expect to see quaint farm houses dotting the landscape. The high dessert is an acquired taste I think, most people just see dirt and sage brush, but when you live here (or in other places where you can see for miles in any direction) you learn to look beyond what is immediately in front of you. Out-of-towners can't seem to see the mountains! click for big, you can see another mountain range to the right. The tallest peak in Lander County is to the left, Mt. Lewis at 9,573 ftThis is looking towards the southern mouth of the valley, towards Austin. As you get farther south, the mountains get closer together and the road twists and turns through lush green cattle country and Reese River actually runs with water there; it is a dry wash this far north. Looking West, into the Tobin Mountain Range where it is said Battle Mountain got its name (not the closest one, that was put there after the fact ;-). I would tell the story, but these guys tell it better. Synopsis; some guy said he and a wagon train he was guarding were attacked by Shoshone indians on a mountian. I'm tellin ya, the other story is much better. Farther West is Winnemucca, NV. OK, I photo-shopped this one just a little; I wanted you to see the fog. This is looking East into the Shoshone Mountain Range. On the other side is Cresent Valley, at the southern end of which is the Cortez Gold Mine where my DH works. Further East is Elko, NV. Last but not least, a view to the North and the town of Battle Mountain. Established as a mining district and siding for the railroad in 1868, and later (much later, you really should go read the page at the last link) made the county seat of the great County of Lander. 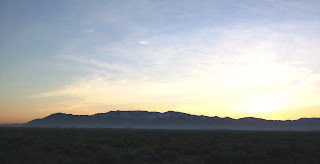 The mightly Humboldt River runs just to the North of Battle Mountain as it wends its way from its birth at Humboldt Wells, just out side of Wells, NV, around several mountain ranges for 300 miles to the Humboldt Sink in the valley that Lovelock, NV occupies. 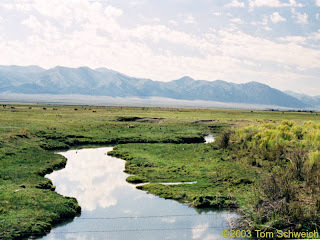 The Humboldt River is the longest river in the Great Basin. So, this is what I see on my way to work ever morning. I took all of these pictures at one time, parked on the side of Historic HWY 8-A, which at one time ran 99 miles, all the way to Austin hugging the mountains and the now removed train tracks that also went all the way to Austin and down the middle of Main Street (back durring the silver rush, when the population of Austin was over 50,000!! It is now about 300). These train tracks (and the HWY) served hundreds of people in small mining settlements along its length, all of which soon followed the tracks back to Battle Mountain and the settlements they left became memories and ghost towns. I didn't fall in love with Nevada until I lived in Winnemucca for two years. Even tonight when I closed the gate and looked up at the hugh sky and all those stars, I wondered where else I could live that would be as wonderful as this?! Your pictures are wonderful. I need to post pictures of Nevada more often, because it's every day to us, but new to our blog friends. My dad used to say that God made country like this so you could see for miles. He was right...anytime I drive through, or am in, areas others consider "desolate" I think of that statement. Our NZ in-laws were just amazed by miles and miles of miles and miles when we went through the reservation up to Page, then through Utah to LV - they had never seen such wide open country before.